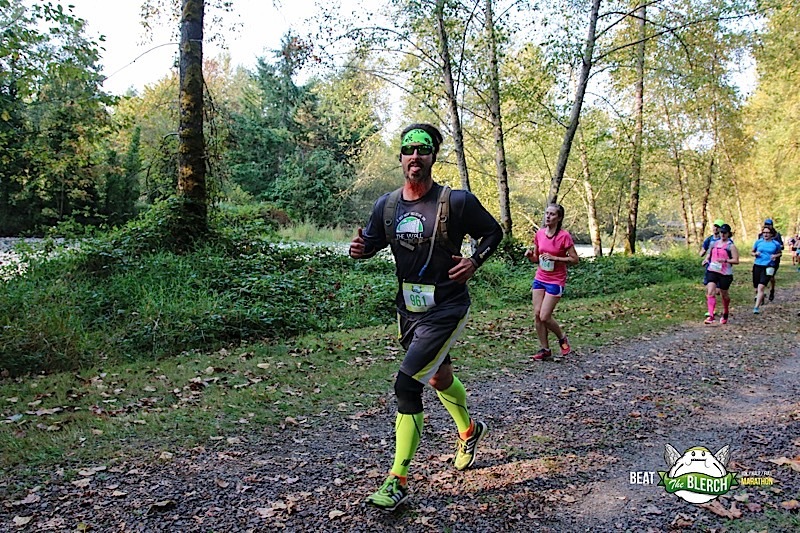 Carnation, WA – For my first ever official half marathon, I chose a “silly” one. 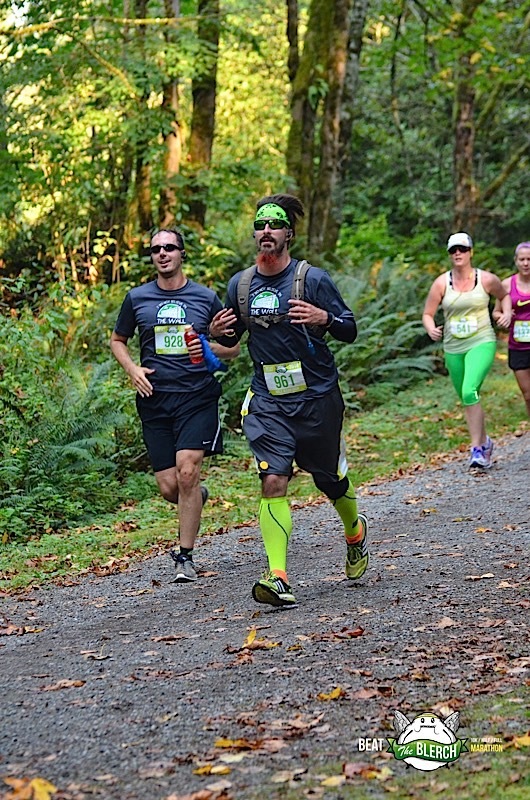 Why is this half marathon “silly”? How about having couches, cake and a purple drink at each water station? Not “silly” enough, how about various Blerches reminding you that “you don’t have to do this!” and “Lets go sit on a couch and watch a movie instead! ?” For the history on the Blerch, read here. 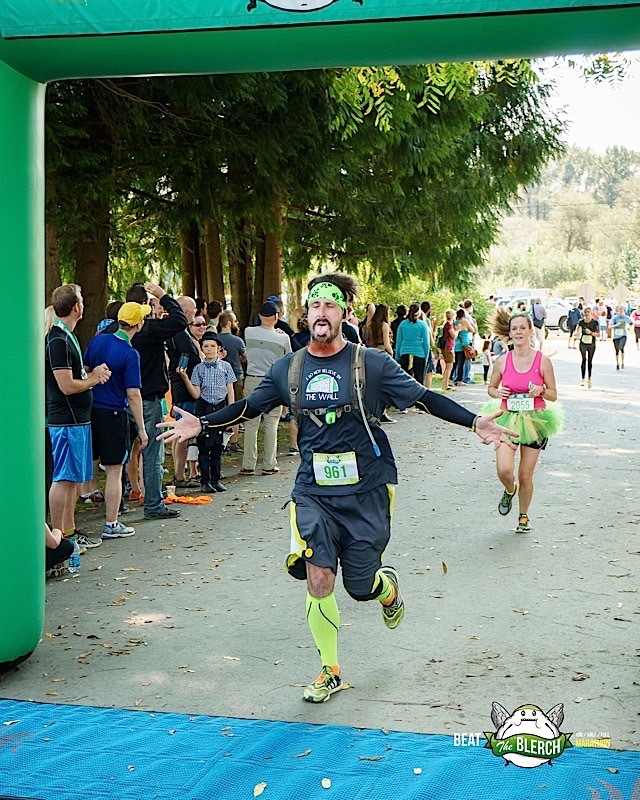 This race was an interesting race, not just because of the silliness, but it was a 99% trail run, not really what I was expecting. I started off really strong, running under 9 minutes a mile for the first couple of miles, but then the funkiness of the day started to set in. You see, I drove up from Portland, OR to Carnation, WA the day of the race and I had been up since 3:30am and slept terrible during the night. I was up every single hour. I guess I was worried that I was going to miss the 4am alarm that my body and mind woke me up every hour starting at 11pm. Yay! A 3.5 hour drive later and I was at the race location picking up the race packet and got ready to run. Stretching, walking around, keeping my body warm. At the first water station, I thought it would be cool to have a seat on the couch and take in what Blerch had to offer. That turned out to be a silly choice. Sitting right after running 3 miles was somehow just enough to give me a cramp in my right side. Awesome. 10 miles to go with a cramp. Needless to say, I did not stop at any other couch for a rest, Blerch be damned. I had done two practice half marathons prior to the race as part of my training, but the last mile for the Beat the Blerch was not fun. Cramping, blister building and thanks to a well placed rock during the 7th mile that I stepped on trying to create a bigger space between the big toe and the toe next to it, I was in great shape (rolls eyes). I had stopped to walk 6 times during the last few miles, something that I didn’t have to do in my practice runs. I finished the race and shockingly beating my fasted practice run by over 4 minutes. Not too bad for the issues that I had near the end of the race. My buddy Quinten from Regular Joe Fitness showed up at the race a few seconds before I finished the race and caught my finish with video! After the race Quinten and I had lunch at a local bar/diner and had a great time. 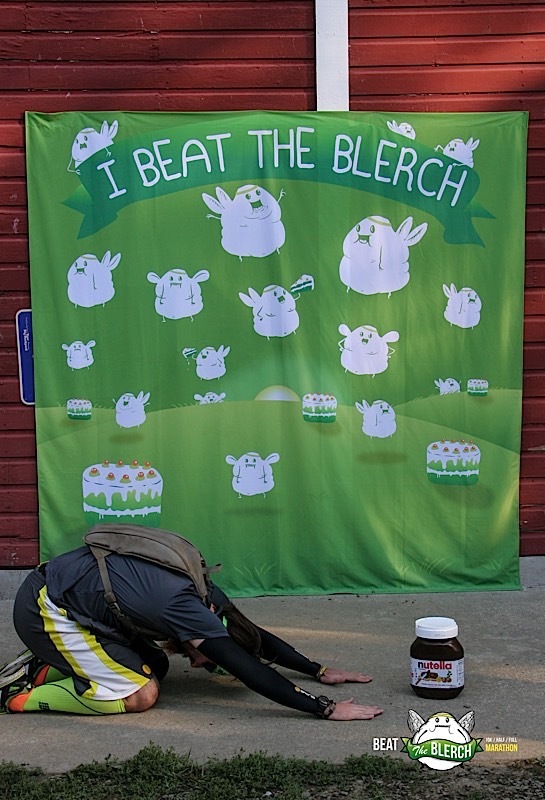 On a sad note, one of the Beat the Blerch racers did not finish the race as 28 year old Evan Sebenius collapsed near the end of the course. 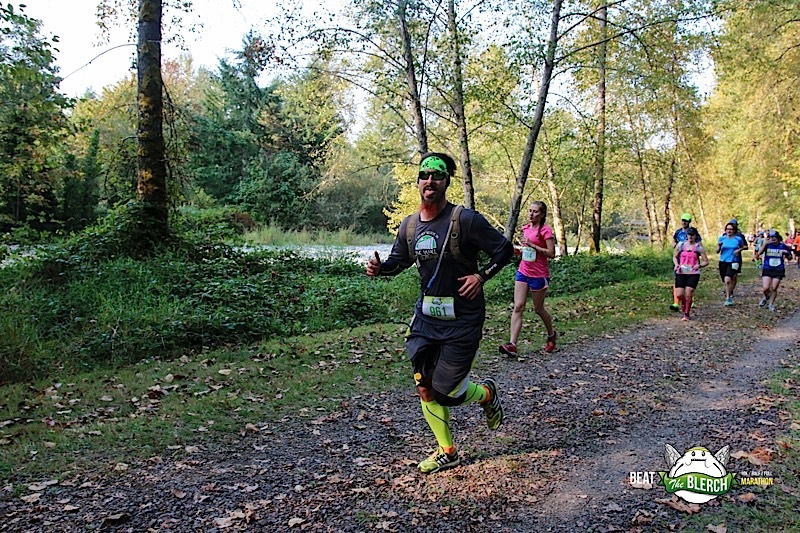 A fellow Spartan and Beat the Blerch runner will have a memorial 5k at the Beat the Blerch location on 11/2/2014 and virtual runs that day as well, with the hashtag #RunEvanIn. 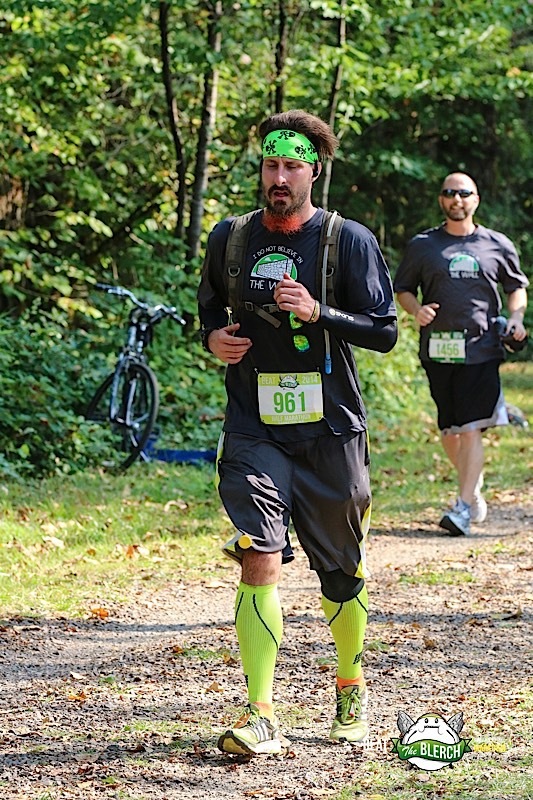 I’ve dedicated my Super Spartan race in Ohio to Evan. right before I sit and give myself a cramp! yea! And Done! First Half Marathon completed!